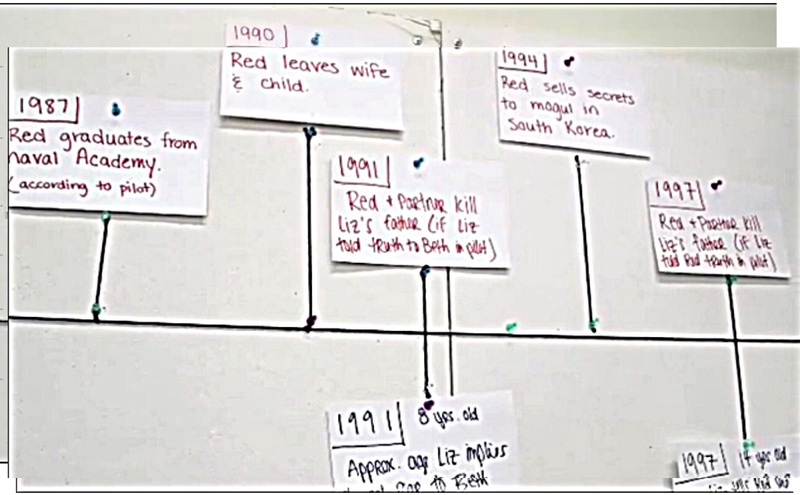 EDIT: This timeline hasn’t been updated for any information given after S2E7. The way the Stewmaker!clue/Berlin’s daughter’s plotline was handled, convinced me that keeping any detailed information about timeline/clues etc. on the show is fruitless as things will get bend and redefined by TPTB to their immediate needs to tell a story, regardless of the clues/information that have been given episodes or seasons before. That’s the end of the cracklist story for me. 1984 – Reddington graduates from the Naval Academy at the top of his class by the time he is 24 (S1E1) The Naval Academy is a four-year coeducational federal service academy which implies that Red entered the academy in 1980 at the age of 20 (x) Today an applicant has to be unmarried and is not allowed to have an obligation to provide support to a dependent at the time of enrollment (x). It is unclear if this “gossip” is true. 1990 – Naomi Hyland, the former Mrs. Reddington and her daughter Jennifer are taken into protective custody. The exact date or month is so far unclear (S2E1 + S2E2). And until S2E1 the concrete fate or whereabouts of Reddington’s wife and daughter were never mentioned on the show. 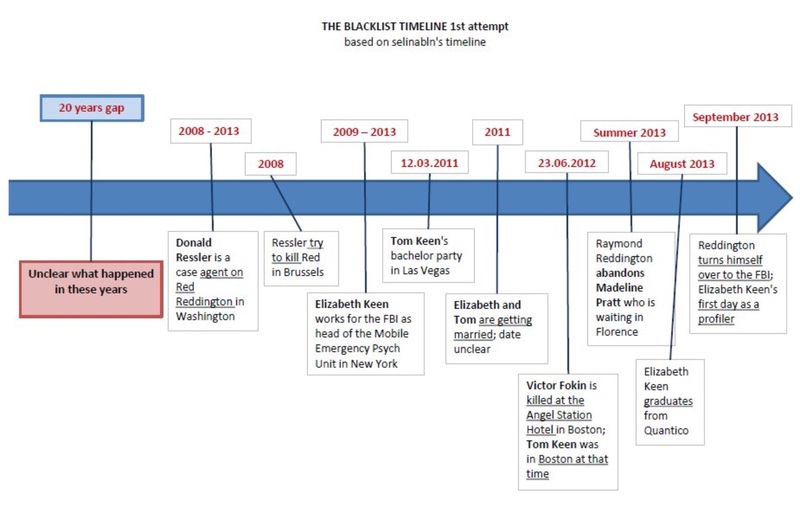 Even after the appearance of Naomi and the information about her and her daughter’s whereabouts in 1990, it is still not entirely clear which version of events is true or what Red did/happened to him in the years between Christmas Eve 1990 and his reemergence 1994 on the radar screen of the FBI. Especially as it is strongly indicated that something – at least to Reddington’s believe – happened that night in Reddington’s family home. a) in S1E7 Reddington buys the house again with the sole purpose to blow it up. Seconds before the explosion he says, “I spend every day trying to forget what happened here. This should help.” Before the house is destroyed, he remembers a girl with long blonde curls playing in the garden, most likely his daughter. December 1990 – The Stewmaker takes a photo of one of his victim, apparently a young woman. In 2013, Reddington removes that photo from the Stewmaker’s trophy book at the end of S1E4. The pictures holds the caption: “#79 12/90”. The same photo is seen in Berlin’s/The colonel’s pocket watch at the end of Berlin, Conclusion (S1E22). In S2E1 it is confirmed that the picture truly shows Berlin’s daughter who fell in love with a dissident towards the end of the Cold War. Berlin believes Reddington to be responsible for his daughter’s fate/death (S2E1) Reddington claims to have been falsely accused by a third party (S2E2). Which circumstances would even make it possible for Berlin to believe Reddington was responsible for the death of his daughter who the KGB sent back in pieces to him into the gulag is completely unclear so far. From The Blacklist writers’ room… (Screenshot from video). Darkened for legibility. 2008 – 2013 – Donald Ressler is a case agent on Reddington at the Washington Field office. 23.06.2012 – Victor Fokin is killed at the Angel Station Hotel in Boston; the murder weapon is the same gun Elizabeth discovers later in the box, that was hidden in the floor of her house. Elizabeth and Tom Keen are in Boston at the same time of the homocide. Tom Keen claims to have had a job interview at the hotel when Fokin was murdered. (S1E6, S1E5) Tom Keen is cleared by the FBI in the Fokin case in S1E6, when Gina Zanetakos claims to have been hired by Reddington who denies any involvement in it. The matter is not adressed anymore on the show. However, the reveal of Tom Keen’s true allegiance with at least fake!Berlin and his later actions let it appear likely that he was truly responsible for Fokin’s murder, along with Reddington’s claim that he has never lied to Elizabeth (S1E17). 3) What happened to Reddington/what was he doing between December 1990 and 1994? 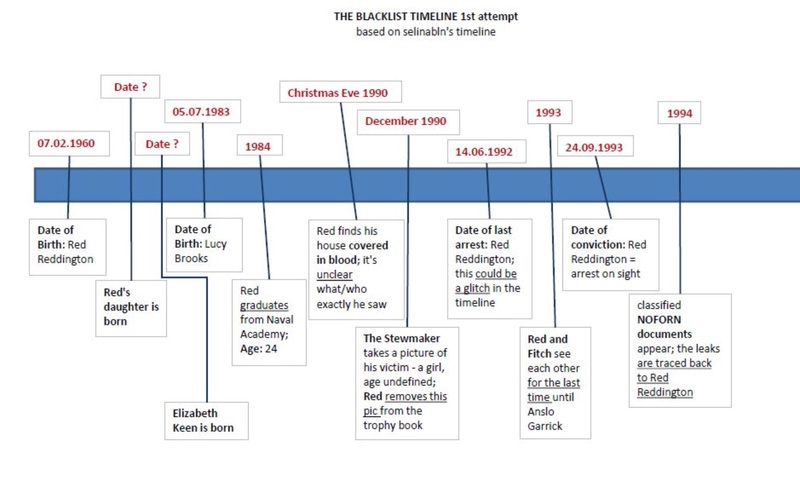 4) Is the date of Reddington’s last arrest (14.6.1992) a simple glitch in the timeline? According to Ressler, the first documents that could be traced back to Reddington appeared four years after his disappearance – that would be 1994. If I copied and pasted the whole timeline, it would be the longest post ever, so here are the highlights. I did a lot of research about certain things he says and will put “estimated” next to years that I am not sure of and I will put solid years for those that are listed in the script. Estimated 1963 – Born – this seems to make him too young to watch ballerina girl in 1987, but this date makes sense based on statements I will paste below. Red: [ Chuckles ] You know, as my father used to say to me, just because you’ve been bumped up to first chair in the orchestra doesn’t mean you can compose a symphony. Red: This is fun. Who had the pleasure? Workman. : That would be me. Head on. 35 miles an hour. Red: Please don’t make me return the car. I’ve always secretly wanted a Wagoneer. It smells like Dad’s car. Like peanut shells, gasoline. [ Laughs ] Elizabeth, if it helps to salve the wound, we did bring a fugitive to justice. Red: I haven’t felt this giddy since Herbie Hunnicutt and I pooled our box tops and sent away for the decoder ring and periscope. Why is that? What is this feeling? Dembe: You love treasures, Raymond. Red: And you don’t? Of course, you do. Everyone loves hidden treasures – Yamashita’s Gold, the Oak Island Money Pit. Hell, even DB Cooper, which was more of a mystery and less of a treasure hunt, really. Dembe: That’s what you love – the mystery. Red: Mystery? You know why? Red [ trying to distract Denisov ]: Sacrifice the bishop. Reykjavi­k, ’72. God, I can remember it like it was yesterday. I was in Steven Bash’s rec room down in the basement, eating fried egg and bologna sandwich when he did it. Denisov: Did what? Who did?! Red: Partnerships. They can be very rough. Mmm. Ah! [ Swallows the spirits ] [ Chuckles ] You know, BJ Simpson and I started a lawn-mowing business in the summer of ’72– bagging, hedging, the whole ball of wax. One day, I’m out rototilling Pat Hunt’s garden. I go in for a bottle of pop– must have been 110– and there’s BJ in the sunken living room, shoes off, feet up on the couch, eating a fried-bologna sandwich, watching Mike Douglas. Mike Douglas! Can you imagine? I quit that day. Red: Revenge isn’t a passion. It’s a disease that eats at your mind and poisons your soul. I attended summer camp with this little stick of a girl Twila Stansberry. Hell of an athlete. Capture the flag. Had an unrelenting passion for fitness. Never skinny enough. A pound here, a pound there. Ran like a deer. Until she couldn’t could barely walk. Turns out she was anorexic. The disease caused her to lose her sight. I’ve never known anyone more obsessed with their body than Twila. Spent her entire life chasing something that destroyed her. Make sure your passion isn’t your sickness. Red: So I get a babysitter now? I haven’t had a babysitter since Brenda Gilroy. My God, pot pies, Lawrence Welk, bath time with Brenda. Still my perfect Saturday night. Red: [Chuckles] You know, when I was 15, I had a summer job installing carpets for Albert Kodagolian on Lake Charlevoix. Horrible job, hot, indoors, forced to listen to “The Gambler” on 8-track while the rest of the world was at the beach. Three days into the job, I knew I had to quit. I asked my father for advice. All he wanted to know was whether I’d given my word to Mr. Kodagolian that I’d work the summer. I told him I had. My father suggested I stick it out. I’d given my word. Worst eight weeks of my life. Until the last day. Mr. Kodagolian shows up at the jobsite, pulls me aside, and tells me that in 27 years, no kid has ever made it through the summer, gives me a bonus $40. The most valuable money I’ve ever made. A priceless lesson about life. Value loyalty above all else. (According to Judah ben Tema, “At five years the age is reached for studying Mikra, at ten for studying the Mishnah, at thirteen for fulfilling the mitzvoth, at fifteen for studying Talmud” (Avot 5:21). Red: It’s a private language carnies use to keep outsiders from understanding what they’re talking about. I spent two summers operating the Whack-the-Cats at the Emmet County Fair (in Michigan). And to be honest, I had no idea what the hell any of them were saying. But I’m pretty sure this one was telling this one not to cooperate. Bad advice. Red: I was a lifeguard my junior year in high school. Had to give mouth–to–mouth to Mrs. Beerman. She belched up a lung full of corned beef and chlorine. I haven’t been in a pool since. Niko: I’m sorry weren’t you in the Navy? Red: [ LAUGHS ] This reminds me of our high-school production of “Guys and Dolls.” A rousing rendition of “Fugue for Tinhorns.” Stubby Kaye has always been something of a role model. Sinclair: I don’t know who that is. Red: Stubby Kaye? “40 Pounds of Trouble (1962)”? Sam the Shade in “Cat Ballou (1965)”? Ah. Doesn’t matter. Let’s hear about the plan. Red: [ Sighs ] When your mother was pregnant with you, it was terribly inconvenient. The Cold War was ending. Her country was falling apart. Everything she had ever known. She dreaded having a child. Almost aborted it. Not one day of her pregnancy did she ever think of you as anything but a curse. And then, from the second you were born there was never a day when she thought you were anything but a blessing. In my experience, there is never a convenient time to have a child. It certainly isn’t a convenient time for you. But if in saying that, I left you with the impression that I didn’t think you should have your baby, I’m sorry for that, because nothing could be further from the truth. Red: Katarina Rostova was the cleverest, most resourceful woman I have ever known. Liz: What are you saying? Red: No matter how dark the moment, she could always find her way through. Liz. She was a Russian spy who I never knew. Red: No, you didn’t. But that doesn’t mean your mother is gone. I see her in you every day. She’s as much a part of you as the air you breathe. Liz: I can’t do this. Red: You can. You must. Red: It may be hard for you to imagine, but I once had a relatively normal life– bills to pay, playdates, family, some friends, people to care about. Lost all that. Red: I first met Stratos Sarantos when he was running guns to Cypriot resistance fighters in 1987 (Greece). For more than 20 years, he’s overseen my shipping concerns from the Bosphorus (northwestern Turkey) to the Suez Canal (Egypt/Israel). He knows enough. 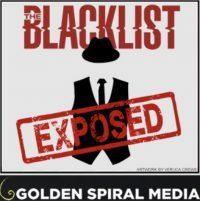 Cooper: (Real Raymond) Reddington was stationed overseas working counterintelligence. Cooper: Seaduke made (Real Raymond) Reddington and dispatched a team of Spetsnatz to abduct him. For 10 days, they tortured him, until he was rescued by an FBI-SEAL Joint Task Force. I was working lead on the agency side. My job was to secure the physical evidence in the event that Seaduke was captured and prosecuted. Ballerina girl performs for the last time – this would be consistent with him losing his family the following year, assuming the recital was an annual performance; what is not consistent is the girl’s age at the time. Fake Red would have been only 24 years old in 1987 if he was born in 1963. This is the only piece of evidence that I have found that contradicts my timeline based on his quotations. Red: I didn’t give Sutton Ross bogus plans for the [ CHUCKLES ] Grayscape Seventeen. June 1989, I coordinated Operation Minesweep, which provided back office support and oversight for Naval Intelligence operations in Kuwait carried out by the 160th SOAR. The op was off the books but can be confirmed by Assistant Director Harold Cooper. Cooper: If this is some kind of threat? Red: You think your life is too dangerous for a child. But what is your life without one? I can tell you from personal experience– not much. What? Red: [ Exhales ] Losing someone we love is painful. Agonizing even unto death. The Japanese call it tako-tsubo – a grieving surge of abnormal electrical waves that causes the heart to deflate and contort until it resembles a fishing pot. Hollow and cold, an empty vessel at the bottom of a fathomless sea. I’m sorry for your loss. You have suffered enough of that in your life. Red: You ever wonder why Dembe stays with me why anyone so decent would spend his days at the side of someone so indecent? Liz: You saved him. He owes you his life. He protects you because you protected him. Red: Truth be told, being stuck stateside has left me feeling somewhat smothered as of late. Oh, my goodness. Look at those Guan vases. And that flatware. Did you know Nancy Reagan – She could dress a table specifically for that night’s guest at a moment’s notice. Russian Silver for a tea with Gorbachev, Italian silver stag-head stirrup cups for a last-minute supper with Sinatra. Can you imagine? Liz: Sinatra? I can’t imagine. Liz: I know now that those bones in that bag are Raymond Reddington’s – the real Raymond Reddington. My father. I know that this man is an impostor. Why he came into my life, why he took your life, why he spent the last 30 years pretending to be Raymond Reddington. I’m gonna figure all that out, and then I’m going to destroy him. Late 1989 Masha is Abducted/Night of the Fire (When Liz was having her memory examined in Luther Braxton, she was being taken back to a fire that happened 26 years ago, and the air date of that episode was in 2015, so 2015-26=1989). Red: Your parents loved each other very much. The Cold War was hard– too hard for your father. When the Soviet Union was collapsing, he took you from her. She gave up everything to follow him, to follow you. Liz: The night of the fire– that’s what they were arguing about? Red: Your mother, despite what he’d done, she wanted him back. She wanted them to be a family. As much as it pains me to say it, he was probably… the only man she ever really loved. Liz: And I shot him. Red: It was an accident. Liz: Tell me. I need to know. Red: Your mother was never the same after that. The man she loved killed by the child she adored– it was… just too much. Two months later, she went to Cape May and left her clothes on the beach, walked into the ocean, and was never seen again. Liz: So, that night, I killed both my parents. Red: You were a child. There should never have been a gun for you to grab. Red: Looking back, I’m not sure I shouldn’t have raised you myself. I don’t want you looking back with that kind of regret. Katarina: A man was seen carrying her off the campus. A blonde man. Katarina: I started pulling away. We couldn’t continue the way we were. He didn’t take it well. Kathryn: So what he– he– he stole Masha to hurt you? Katarina: No, that’s not it. He thinks she’s his. Katarina: I don’t know, Kate. I never found out. I didn’t want to. It didn’t matter. I was never gonna end up with Raymond. Kathryn: Did you give the police his name? Katarina: Never. It’d put Masha in danger– even more danger. I know where he’s taking her. Home to America. I’m gonna have to find her on my own. Red: There was a time in my life when I was quite sure I knew exactly what happened to Katarina Rostova. But after all these years, I’m not sure I have any real sense of how or why she disappeared. Liz: My mother’s alive. You lied to me. Red: Velov is the one who lied to you, Lizzy, not me. Katarina Rostova committed suicide in 1990. Red: [ Pause, then: ] It was a Hobson’s choice. * There was a woman and her child. Both were doomed. Both would die. I could either save one or lose both. I chose the child. It was… it was the worst thing I’ve ever had to do in my life. Worst thing by far. Woman: You didn’t have a choice. Red: There’s always a choice. I was arrogant. I presumed that there was an order to things, that there was… that if I nourished and protected and taught the child, she would be safe… …and happy. Woman: And she was neither. Woman: And now you’re dead. You believe there’s nothing left for you. Woman: Nothing about you is obvious. What brought you here? Red: I honestly don’t know. Woman: You’ve been here before. Red: Once, a long time ago. I was a very different person then. You? Red: There was a woman I loved. She was… my life. My heart. And she died. She left behind a little girl. One last, precious piece of herself. Woman: He was her father. Red: And to harm him would be to harm her. A mortal sin. Her mother is gone. The father is what she has left in the world. Woman: You had no choice. It was me or Masha. Woman: Raymond, you did save me. Through her. It was the only way. You chose well. Liz: Do you think she’s dead? Katarina? I know they say she committed suicide, but there was a man, Anton Velov. He was a Colonel in the Spetsnaz. He said she might still be alive. Dom: I never heard from Katarina after she left for America. What really happened to her I think there are some people who want to keep ­that information a secret. And I think they will do whatever is necessary even now to keep it that way. Dom: She was here – Masha. Dom: How is a problem, yeah, but not as big a problem as why. She was here looking for Oleander. Apparently, she thinks tracking him down will help solve her husband’s murder. Red: What did she say? Be specific. Dom: Relax. She doesn’t know Oleander’s me. I certainly didn’t tell her. And since I know ­all you care about is yourself, you can stop worrying. I didn’t say a word about you. My own granddaughter three feet away after almost 30 years, I couldn’t say a damn thing to her. Red: In 1990, the KGB and the CIA had almost nothing in common except the mutual determination to hunt down one individual. Red: Being a fugitive from American law enforcement is a lot easier than being a fugitive from the two most powerful nations on Earth. And anyone close to a target of theirs becomes a target themselves. Red: Especially family. Unless they’re abandoned on the side of a road on Christmas Eve. Lilly: After you left, we went into Witness Protection. Red: An effective, albeit excruciatingly painful solution. Red: You survived, as did your mother, to whom I hope you are now willing to take me. Lilly: So, you’re saying you were framed? Red: I’m saying a perfectly plausible narrative was created. Lilly: By some shadow government called the Cabal. Red: Secret societies exist. 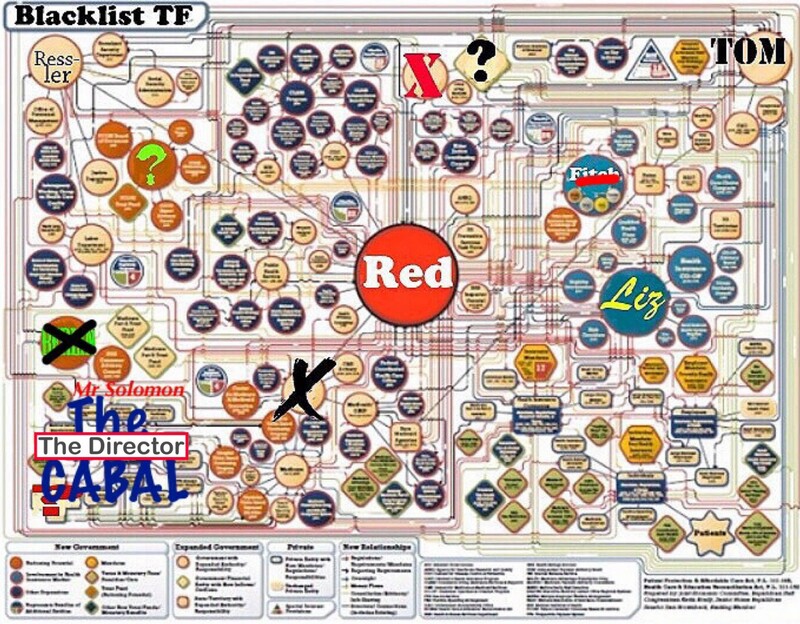 The Cabal, the Trilateral Commission – private organizations that harness powerful forces to tip the scales in their favor – military engagements, UN interventions, treaties. The Cabal is the one I stumbled across – and tried to destroy. To prevent that, they tried to destroy me. Red: I was completely swept up in the idealism of the theatre owner – a pipe-smoking cream puff of a German named Gerta. She read “Mother Courage” to me aloud – the whole play in one sitting. A brilliant exploration of the politics of war and those who profit from it. Sadly, it was 1991, and audiences were going in droves to see “Cats.” Gerta lost every penny of my investment, but she remains grateful to this day. Her theater is ours as long as we need it. Red: You know, 29 years ago in Sierra Leone (2014-29=1985), there was a farmer named Samwel Zuma who had the audacity to identify several low-level Mombasa operatives to local authorities. The cartel massacred the entire family. All but the youngest son. He was sold to a local ring of flesh peddlers. The majority of children in those circumstances don’t last more than nine months. He survived eight years (1985+8=1993). He was 14 when I found him. Too old, too tall, too angry and dangerous to be of any further value. He was left to die, chained to a standpipe in the basement of a squalid brothel in Nairobi. Branded, burned, barely alive. So I took him. Made him well, saw to his education. He graduated university with a bachelor’s degree in English Literature. He speaks four languages fluently and can get by in a half a dozen more. He is splendid. His name is Dembe – Dembe Zuma. Lilly: To protect me from that, from you, she walked out of my life. I didn’t even know she was dead until she’d been gone nearly a year. Dembe: No, Raymond. Remember why you surrendered yourself to the FBI in the first place. Remember what all of this was about. You can’t give up now. You can’t let Kate destroy everything that gives you purpose. Our work is not yet done. I loved Kate, too, but it’s time to end this. Stop it. Stop her. Red: [ To Dembe who is digging into a grave with a shovel ] This is above and beyond, my friend. Above and beyond. Red: If anything happened to me, this was to go to Elizabeth. Red: So she would know. Red: Now I’m not sure I ever want her to know. Dembe: Perhaps, Raymond, in this case, what you want is irrelevant. Dembe: If the universe wants her to know, she will find a way. Director: I know who you really are, Raymond. Who you are to her. And I know why you did this. Does she?